Better late than never, Spring has finally sprung at my home in Northern Wisconsin. The record-breaking snow blizzard two weeks ago has almost all melted into memory, and things are starting to green up at last. Like a bear waking up from a long winter’s nap, I am coming out of hibernation to resume my blogging practice once again. And I really wasn’t hibernating completely, although I admit that there would have been no way for my fans and followers to know that. 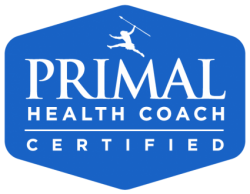 I finished my Primal Health Coach certification course at the start of February. I have worked with several clients since then, but my most important client was…me! I made a more serious commitment to the 10 Laws of Mark Sisson’s Primal Blueprint lifestyle (you can read them in his own words here: https://www.primalblueprint.com/blogs/primal-blueprint/the-10-laws-of-the-primal-blueprint). Before the first of February, I think I could say only that I was “experimenting” or “dabbling in” the full program. And that’s why I wasn’t getting the results I wanted. And why I didn’t look like a good role model for my business. And now that I’ve made some progress (down 10 pounds, and blood sugar under control), I am going to do a series of posts for you that will explain the laws just a little bit. Then I’ll add my tips and tricks about what worked best for me. Look for those posts every Tuesday right here.